Naturalized in California in 11 counties according to Calflora. Also Naturalised in some parts of south-eastern Australia (i.e. on the central and southern tablelands of New South Wales and in southern Victoria). Possibly also naturalised in south-eastern South Australia (Queensland Government) as well as New Zealand, Europe, Central and South America (GBIF). Naturalized in California in 11 counties according to Calflora. Also Naturalised in some parts of south-eastern Australia (i.e. on the central and southern tablelands of New South Wales and in southern Victoria). Possibly also naturalised in south-eastern South Australia (Queensland Government) as well as New Zealand, Europe, Central and South America (GBIF). Some of the areas where K. uvaria occurs in Australia match the climate of California based on the Cal-IPC climate map. K. uvaria is listed in Randall (2012) as an environmental weed or as naturalized. It is considered an environmental weed in Australia, and has spread into natural areas where it forms thick clumps of vegetation and threatens sensitive ecosystems (Victorian and Queensland Government). K. uvaria is listed in Randall (2012) as an environmental weed or as naturalized. It is considered an environmental weed in Australia, and has spread into natural areas where it forms thick clumps of vegetation and threatens sensitive ecosystems (Victorian and Queensland Government). Some of the areas where it occurs in Australia match the climate of California based on the Cal-IPC climate map. The species of Kniphofia in Randall (2012), other than K. uvaria, are listed as naturalized or weeds, not as environmental weeds, invasive or noxious. Almost all of the areas outside California where K. uvaria occurs do not match the climate of California according to the Cal-IPC climate map. In Australia, K. uvaria is considered an environmental weed and has spread into natural areas where it forms thick clumps of vegetation and threatens sensitive ecosystems (Queensland Government). Reported to respond to fire, (increased flowering). No evidence reported of the species altering the fire regime of an area (Victorian Government). Kniphofias contain knipholone compounds, making them toxic if eaten. Kniphofias can also cause eye and skin irritation (Kew Science http://www.kew.org/science-conservation/plants-fungi/kniphofia-caulescens-lesotho-red-hot-poker). Can grow in riparian areas, however only grows to 120 cm and the leaves only have minor serrations. Therefore only has minimal nuisance factor (Victorian Government). In Queensland it has spread into natural areas where it forms thick clumps of vegetation and threatens sensitive ecosystems (Queensland Government). Jepson eFlora lists it as growing to 130 cm (51 inches), but there are no reports of it forming impenetrable thickets. Produces seed and spreads by rhizomes (Victorian Government). In Australia, plants were documented producing viable seed. Gardeners also propagate the plant by seed. Conran, J. G. (1987). 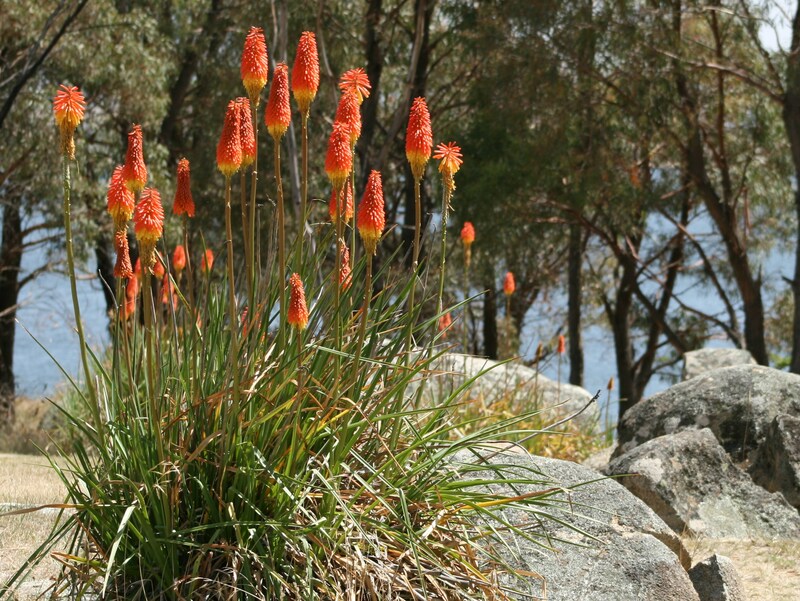 The Genus Kniphofia Moench Aloeaceae in Australia. Muelleria. 6, 307–310. In Australia, plants were able to produce over 9,000 (estimated) seeds per plant. In Australia, seed germination of a naturalized population was estimated to be 82%. Vegetative propagules can flower the first year after they are planted (Dave’s garden). Therefore presumed under natural conditions plants can reach maturity within 1-2 years (Victorian Government). In California, K. uvaria blooms from April to July, covering greater than 3 months, and is a prolific seed producer. K. uvaria seeds are dispersed by wind and there is not information available on their dispersal by birds or animals. K. uvaria has small (3 mm long) seeds which are dispersed by wind, however they don’t have any specialised structures to aid this. Therefore it is presumed seeds are capable of dispersing to a distance in the range of 200 m-1 km (Victorian Government). K. uvaria seeds are dispersed by wind and there is not information available on their dispersal by contaminated seed, equipment, vehicles, boats or clothing. Reviewed by Irina Irvine and Denise Knapp.